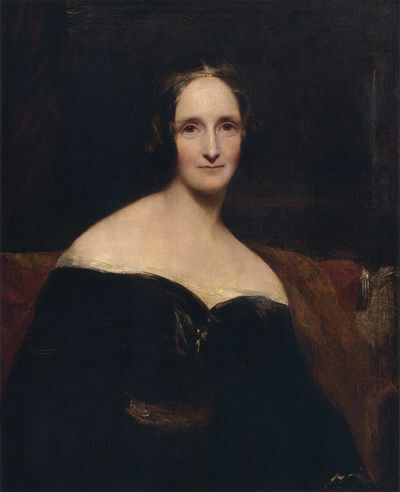 Mary Shelley, one of the most influential horror writers ever. Have you ever read a book that kept you awake at night even after you'd finished it, or gave you nightmares? What's the scariest novel you have ever read? I don't read horror books. Oh! Bryony, so that's a whole genre you're not able to read? I can't read really, really bad horror books, like some that are written these days, same as can't watch some really scary TV shows. But I do like the horror classics, by Edgar Alan Poe especially, Mary Shelley, & Robert Louis Stevenson. But I wouldn't read Stephen King. IMO, some of Shakespeare's plays are 'horror stories', 'Titus Andronicus' definitely. The 'traditional' tragedies' are pretty horrendous, in each, their own way, methinks! Oh, actually I have read those classics - Some Poe, which I liked, Frankenstein and Dracula and Jeckyl/Hyde- I liked the story, but not the style of writing. I was thinking more modern horror than monster horror. 'Dr Jekyll & Mr Hyde' by Robert Louis Stevenson. Scared the livin' daylights outta me at 13! Movie with Spencer Tracey was even scarier! Did you see the Sense8 Christmas special?